The Signus ONE Marketing Pavilion provides a truly unique and eye-catching experience. The revolutionary organic design of the Signus ONE brand pavilion guarantees exposure in a way that will make the difference and guarantee results for any brand. The innovative Signus ONE was initially inspired by kite surfing products and is manufactured using the same material that is used to make small sailboats and kite-surf sails. The organic design was thought about at every stage of its creation. From above, the marketing event tent has a round shape with three open sides. The futuristic shape not only provides an outstanding eye-catching experience but also provides the biggest printable surface for maximising brand promotion. 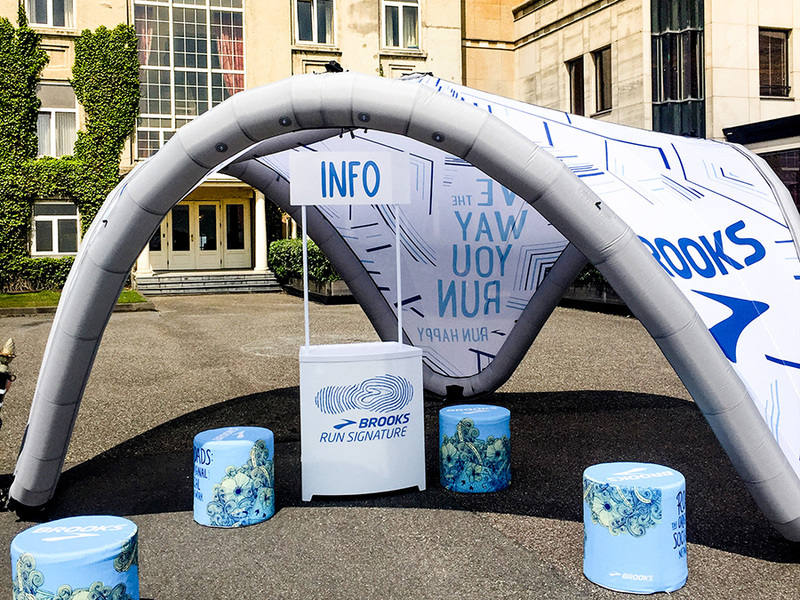 With up to 398 feet² (37 m²) printable surface the Signus ONE is the only inflatable promotional display tent of its kind and which is what sets it aside and makes it completely unique. The Signus ONE inflatable pavilion guarantees visibility in a way that holds the keys to powerful experiential marketing and event promotion. We believe that Signus open an endless range of possibilities for valuable brand exposure and here’s why. 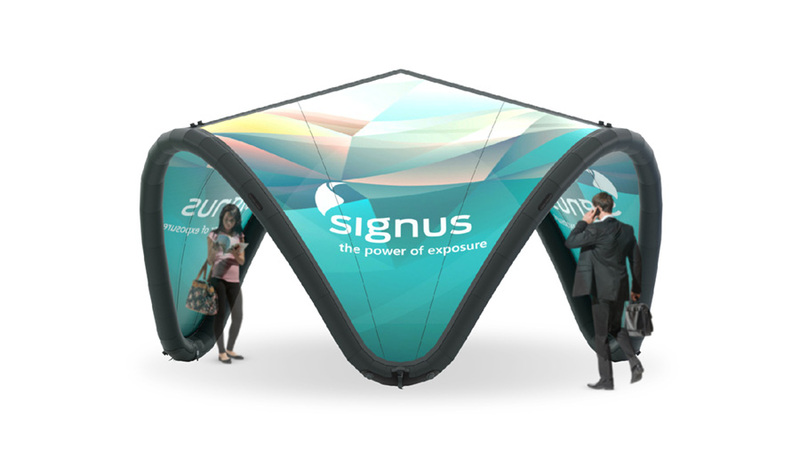 Signus ONE has a unique organic shape – there is no other event tent like it on the market that's guarantees as much promotional power. With a sleek design and smooth curves, the Signus inflatable pavilion will make your business stand out from the crowd at any event. Signus ONE’s clever design makes it look like it is a one-piece structure but it is actually a three-layer system which is made up from an inflatable frame, and two layers of roof cloths. The first layer of roof cloths is a water repellent, plain white fabric which is needed when the Signus is used outdoors. Signus ONE can be customised with your artwork or branding. If you purchase a branded option you will get three roof cloths printed with your branding or artwork. These roof cloths simply zip onto the frame to provide a fully branded inflatable pavilion with high impact marketing potential. It boasts up to 398 feet² (37 m²) surface which is fully customisable and offers maximum brand exposure. You can opt for the same artwork to be printed on each of the three roof sections, or you can create a design which encompasses the whole roof - the possibilities are endless. The versatile and innovative marketing pavilion allows you to interchange your graphics simply by unzipping them. So there’s no need to replace the whole structure if your marketing message changes, simply replace your printed graphics. We create 3D visualisations on the Signus ONE so you can view your customised brand pavilion. Simply send us your logo and design brief and we will create your customised Signus ONE brand pavilion that will get results. The simple use and effortless installation makes the Signus ONE a popular solution for events and exhibitions. Simply, turn up to your event, unpack and inflate in 15 minutes – without the need for any tools or additional manpower. Using the electric pump, the Signus ONE frame is inflated via 6 different inflation valves. Once all sections have been filled with air, the Signus ONE quite simply pops-up, taking an interesting and futuristic form. The roof sections easily zip on to the frame so changing your look has never been easier. 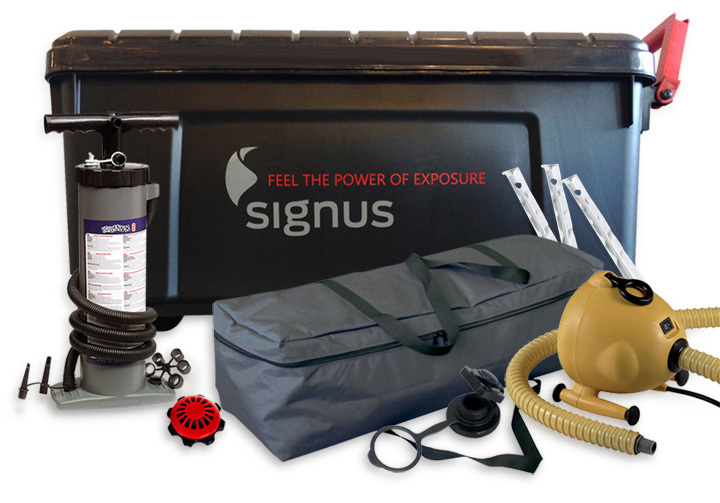 The Signus ONE is complete with an accessory pack which includes a specially designed trolley box, accessory bag, pumps and an anchoring system so that you can begin using the Signus inflatable brand pavilion immediately. The complete kit is lightweight and portable enough for one person to transport from event to event and can easily fit into the boot of a car. For more information on Signus ONE or to arrange a free Signus consultation with an exhibition stand manager please contact us or call 01733 511030.